For over 55 years, the Fisher-Price Little People toy line has provided untold hours of entertainment for children and has fostered a community of avid collectors. Mattel (the parent company of Fisher-Price) has reported that, since the brand’s launch, more than 2-billion Little People figures have been sold in over 60 countries, a clear indication that the toy’s simplicity is a testament to its longevity. The initial appearance of Little People can be traced back to the release of the #959 Safety School Bus by Fisher-Price, in 1959. While earlier toys from the company included figures with human characteristics, they were all permanently attached to the vehicle being sold. The Safety School Bus was the first to include removable figures. Fisher-Price capitalized on the toy’s popularity by releasing additional vehicles with removable figures over the following year, including a Station Wagon and Fire Engine. By that time, the company realized that it had a hit on its hands and never looked back. Fisher-Price didn’t officially refer to its hybrid wood/plastic figures as “Little People”. 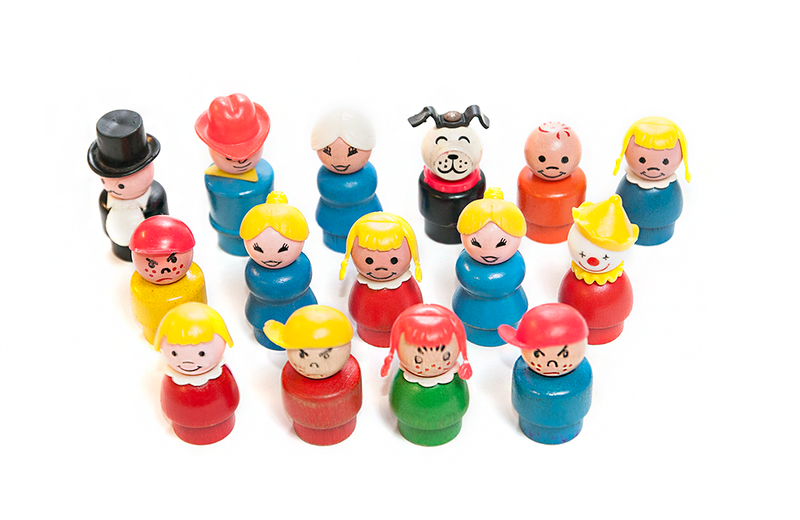 Throughout the 1960s and 1970s, the figures were referred to as the “Play Family.” In 1985, Fisher-Price trademarked the new moniker and formally changed the name of the brand. The “Little People” brand first appeared with the launch of the “Lacing Shoe with Play Family” product in 1965. A year later, Fisher-Price released a stand-alone Play Family box set and gave names to the six figures: “Daddy, Mommy, boys, Butch and Pee Wee, girls, Patty and Penny, and Fido the dog. Before the end of the 1960s, Fisher-Price extended the Play Family Line with the release of the very first play set. The Play Family Farm came with a big red barn, silo, animals, and a barn door that made an unforgettable mooing sound when opened. More classic playsets, including the Play Family House, Play Family Action Garage, Play Family School, and Play Family Airport soon followed. Like most toys with a 50-plus-year track record, Little People have evolved over time and Fisher-Price has made changes to the figures’ size, shape, and material over the years. Initial releases of the figures were made of all wood and then wood with plastic accents. Over time, the shape of the toy became the ubiquitous wide body/narrow “peg” base version that remained in use for over twenty years. A noticeable change in body style occurred in 1991, when the figures were morphed into wider and shorter versions of the “peg” versions. This transformation is often referred to as “Chunky Little People” by collectors. It is widely believed that Fisher-Price made this change in response to growing concerns by consumer-advocacy groups for increased toy safety, and to distance the figures from their unflattering portrayal in Edward M. Swartz’s 1986 book of Toys That Kill, which featured a cluster of Little People on the cover. The chunky body style lasted six years until Fisher-Price again re-tooled the line in 1997. The new figures were all-plastic, smaller in size, and included additional details, such as arms, hands, and facial features. Various Little People characters were also given personalities, opening the door for video and DVD tie-ins. In 2013, Fisher-Price again re-booted the line, moving even farther away from the original concept. The latest re-imaging included online “webisodes” and a “Little People Live” touring show that appeared at zoos and on cruise ships. Long before their 1995 spy mission in Pixar’s animated hit movie Toy Story, little green army men inspired hours of make-believe war-play for children.